Stacia Leigh at Espial Design: The Heart Art Challenge: Finito! Day 28: It's the last day of February, and I have to admit that I'm sorta happy about it. 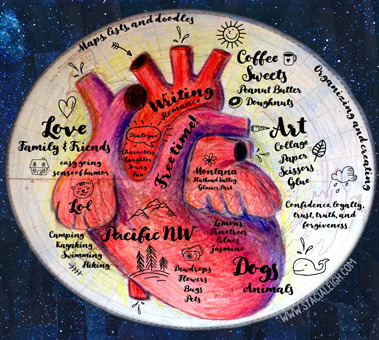 While the Heart Art Challenge has been eye opening--helping me to look for the positive, share it, and have fun--it's also been a distraction from some good writing time. I've been off my game for months...worrying about all kinds of things. But I'm ready to move forward and get back to it. "I forgot to add a bunch of stuff to my heart, but thankfully there's always room for more." ~ Stacia Leigh, quoting herself.